Problem : We have to display elements of matrix in spiral order. For the given matrix mat(4x4). 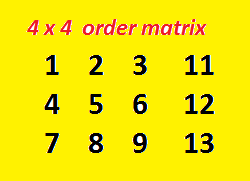 Solution : First we traverse row wise in right direction and then column wise in bottom direction,then again row wise in left direction and again column wise in upward direction, this way we have completed one complete cycle of matrix.We repeat same process until we have row and column elements left. second line(5-6) is outcome of second iteration.